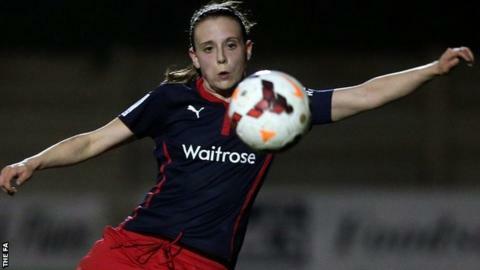 Reading ended Doncaster's 20-month unbeaten league run at home to go top of Women's Super League Two. Lauren Bruton netted either side of Bianca Bragg's goal as the Royals beat Doncaster 3-0 on Saturday, lifting them above the hosts on goal difference. Elsewhere, Helen Bleazard scored the only goal of the games against Everton as third-placed Yeovil moved three points clear of the Toffees. Oxford United moved up to fifth after beating London Bees 2-1. Reading beat Doncaster Rovers Belles without leading goal scorer Fran Kirby, who is the only Women's Super League Two player selected in England's Women's World Cup squad. Kayleigh Hines' 15th free-kick and Katie Stanley's effort put Oxford 2-0 up at the break before Gemma Fraser pulled one back. Aston Villa eased to a 4-1 win over Durham to leapfrog the Wildcats, with Olivia Fergusson and Beth Merrick both scoring twice for the Midlands club. Millwall beat Watford 3-2 to maintain their unbeaten start in WSL 2, climbing to fourth above Everton who drop to sixth.